I have had mine for around 10 years and it works well. Super easy to use and the only time I have a little bit of trouble is on larger cans and find 8t can be a little bit stiff to turn. It’s way better than those old stainless steel ones and I just rinse under the tap after using and let it drip dry. This is a great can opener, no fuss. But since it cuts by the sides, if your can is filled to the brim, the contents are bound to spill. Its a little pricey (I got it for $14). But a little price is nothing when you don’t have to suffer from cuts from opening canned foods/supplies! I would recommend it if you’re the type of person who gets cuts from almost anything (like me)! 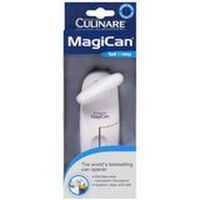 How would you rate Magican Kitchen Gadget Can Opener?